SCE Engineer Grant Davis examines components in one of the 604 racks of battery modules. 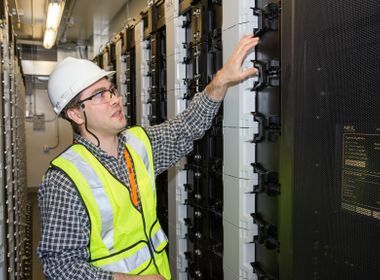 The Tehachapi Energy Storage Project features 604,832 lithium-ion battery cells, housed in 10,872 modules of 56 cells each, stacked in 604 racks arranged in rows. The Tehachapi Energy Storage Project will demonstrate the performance of lithium-ion batteries in storing and releasing electricity under actual system conditions. It seems an unlikely setting for a technology revolution: a wind-swept patch of Mojave Desert, squeezed in beside railroad tracks and a giant cement plant. But there it is, on the grounds of Southern California Edison’s Monolith substation near Tehachapi, Calif.: the largest battery for storing electricity in North America. On Wednesday, SCE unveiled the Tehachapi Energy Storage Project, a demonstration project funded by SCE and federal stimulus money awarded by the U.S. Department of Energy as part of the American Recovery and Reinvestment Act of 2009. The project is strategically located in the Tehachapi Wind Resource Area, which currently is capable of delivering up to 2,000 megawatts of renewable energy from wind turbines and is projected to generate up to 4,500 megawatts by 2016. 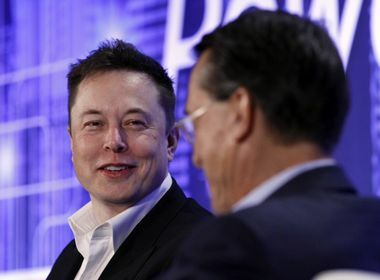 Costing about $50 million with matching funds from SCE and the energy department, the project will demonstrate the performance of lithium-ion batteries in storing and releasing electricity under actual system conditions. Kim pointed out that the Tehachapi project is not a permanent fixture for SCE, it is a two-year demonstration to better understand the technological impacts of battery storage on the grid as well as the economic costs and benefits to the company and its customers. SCE will share results of the project with the utility industry. For years, large-scale energy storage has been viewed as a sort of “Holy Grail” in the electric power industry. Electricity is unique among energy types because, unlike oil and gas, it must be used immediately — the amount consumed in the power system has to equal the amount being generated at any given time. 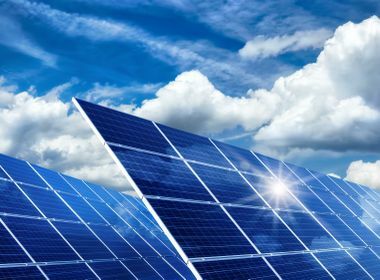 This has made it challenging to integrate intermittent renewable energy sources such as wind and solar, because they operate when wind and sun are available, they’re not always on when needed. As these resources expand, at times they can produce more than the system needs. One answer is to figure out a way to store wind and solar power for use when it’s needed most. Until now, it has not been feasible to store electricity in large quantities. That’s the purpose of the Tehachapi Energy Storage Project: to show how that can be done. The storage system is housed inside a 6,300 square-foot building set in a valley just off Highway 58 between the cities of Mojave and Bakersfield. High on a rocky ridge overlooking the facility spin hundreds of enormous white wind turbines. The facility features 604,832 lithium-ion battery cells supplied by LG Chem — the same cells installed in battery packs for General Motors’ Chevrolet Volt. The batteries are housed in 10,872 modules of 56 cells each, stacked in 604 racks. The whole setup looks much like a “server farm,” such as a cloud storage data center. The battery draws power from the grid when there is excess capacity and stores it for when it’s needed. The electricity is then released back into the grid via the Monolith substation’s “step-up transformers,” which boost the voltage to 66,000 volts for transmission to customer centers. The facility is capable of supplying 32 megawatt-hours of electricity — 8 megawatts of power for four continuous hours. That’s enough to power between 1,600 and 2,400 homes. In a sense, the battery acts as a small power plant, but without needing fuel or emitting carbon dioxide. The Tehachapi project is a step toward meeting a state target of 1,325 megawatts of energy storage capacity by 2020 set last year by the California Public Utilities Commission. Besides the Department of Energy and LG Chem, participants in the project include ABB, Quanta Technology, the Electric Power Research Institute and the California Independent System Operator.